Did you know rich students get financial help from colleges while the poor ones get laden with debt instead? Such is the conclusion of a new report, Demerit Aid, from the New America Foundation. While Pell grants tallied $35 billion in 2012, universities are reducing their own financial aid based on income and instead, shifting those funds to the wealthy students. Hundreds of public and private non-profit colleges expect the neediest students to pay an amount that is equal to or even more than their families' yearly earnings. As a result, these students are left with little choice but to take on heavy debt loads or engage in activities that reduce their likelihood of earning their degrees, such as working full-time while enrolled or dropping out until they can afford to return. The analysis finds that the financial hurdles are highest in the private nonprofit college sector, where only a few dozen exclusive colleges meet the full financial need of the low-income students they enroll. Nearly two-thirds of the private institutions analyzed charge students from the lowest-income families, those making $30,000 or less annually, a net price of over $15,000 a year. There is compelling evidence to suggest that many schools are engaged in an elaborate shell game: using Pell Grants to supplant institutional aid they would have provided to financially needy students otherwise, and then shifting these funds to help recruit wealthier students. Below are graphs from the report. These figures show just how much funding for financial aid has changed. 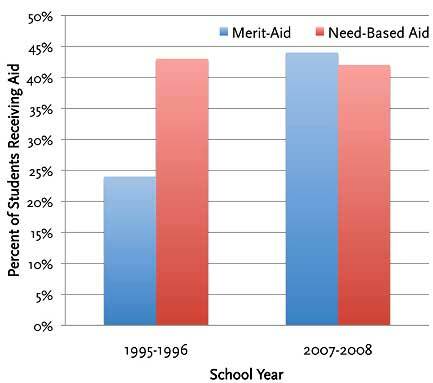 The first graph is financial aid based on income vs. merit in public universities and the second graph is the breakdown in financial aid from private institutions. Merit scholarships are almost mislabeled. These are scholarships for the best students, but this implies high school students, which does not a university graduate make. High schools are also not created equal in the eyes of University acceptance administrators, although the report does not delve into bias against high school graduates from low income areas. Additionally, if students must work while attending school it is almost guaranteed their grades will be lower due to less time available to devote to studies. Yet people who need financial aid the least are getting the most. The report gives an example of Penn State to show how the poor get the shaft on overall costs while the people who don't need financial help for college are reaping in the cost reduction rewards. is double the average charged at public four-year colleges and universities. Despite the fact that Penn State spends nearly $14 million a year on institutional aid, its lowest-income in-state students pay an average net price of nearly $17,000, the fifth-highest of any public institution this report examines. In other words, Penn State’s neediest students do not appear to be getting any discount relative to other students at all. 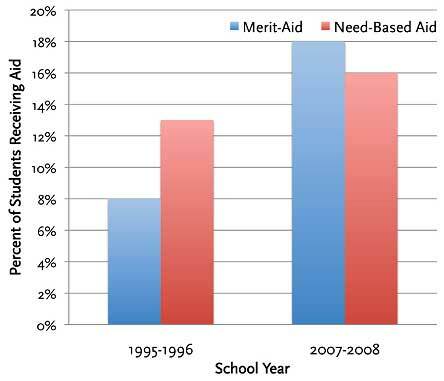 At the same time, about 6 percent of the school’s first-time freshmen received an average of $3,800 in so-called “merit aid” in 2010-11. The situation is worse than just an oversight. It is a deliberate strategy to deny poor people real access to higher education. Schools are engaging in something called admit-deny. Admit-deny means the school officially accepts the student yet offers so little aid, it effectively stops that student from attending due to a lack of financial resources. The message is clear, we don't want you here and schools won't admit it directly. They simply make attendance so costly no middle class or poor student can possibly manage the enormous cost. Inside Higher Ed found that more than one-third of public colleges and nearly two-thirds of private colleges engage in “gapping” — providing lower-income students with aid packages that don’t come close to meeting their financial need. In the parlance of enrollment management, this is often called “admit-deny,” in which schools deliberately underfund financially needy students in order to discourage them from enrolling. Yet when it comes to the wealthy, higher education is spending their time and money making sure the rich are accepted into their institutions. To use the words of the report, higher education is now in the business of providing affirmative action for the wealthy. The competition for the wealthy is so strong that 10 per-cent of college admissions directors at four-year colleges (and nearly 20 percent of those at private liberal arts col-leges) reported that they give affluent students a signifi-cant leg up in the admissions process — meaning that they are admitting full-pay students with lower grades and test scores than other applicants. These colleges are, in other words, providing affirmative action for the wealthy, despite all of the extraordinary advantages that these stu-dents have over their less-fortunate peers. Education used to be the great social leveler. If you were smart, worked hard, the sky was the limit on your future. New America foundation discovered yet another area where the once great American Dream is now a rigged game. Class once again determines one's station and prospects in life, not one's real ability. Now Americans are being denied even the opportunity to discover their real talents and skills. Grants not backed by cash at our small liberal arts college went over $1,000,000 in 1989. We had increase tuition by 6% instead of 3% for a few years charging some and giving grants to others. Over fifteen years it increased so much that it equaled 25% of tuition revenue. We were charging 1/3 more than needed and giving it out to students we wanted. Many got some aid but not nearly the overcharge. Talented students we got the most. Really poorer students paid in full. Most students paid with Pell grants, state sponsored loans, private company loans, and family money. To make the situation worse, these less talented students often lost out after graduation by losing the job hunt to students who got the highest grants. College leaders decided that charging 1/3 more than needed was enough so the college started using college loans to keep students and their Pell Grants/loan money coming into the college. Very high bad debts were just written off. I check Guide Star and found that all noncompetitive liberal arts college I had been associated with were and still are using these questionable procedures. While many students are making a poor financial investment in college, there are worse things. Sometimes the collateral revenue take a few years to show or be appreciated. I encourage people to try work, not to borrow, go evenings, pay to acquire specific skills employers will paty for unless money is no object and then I say go join a frat and enjoy!